Whoa. Check out the difference in that before and after photo! I am so lucky to have an incredible BERNINA 770QE which lights the space under my sewing machine beautifully. 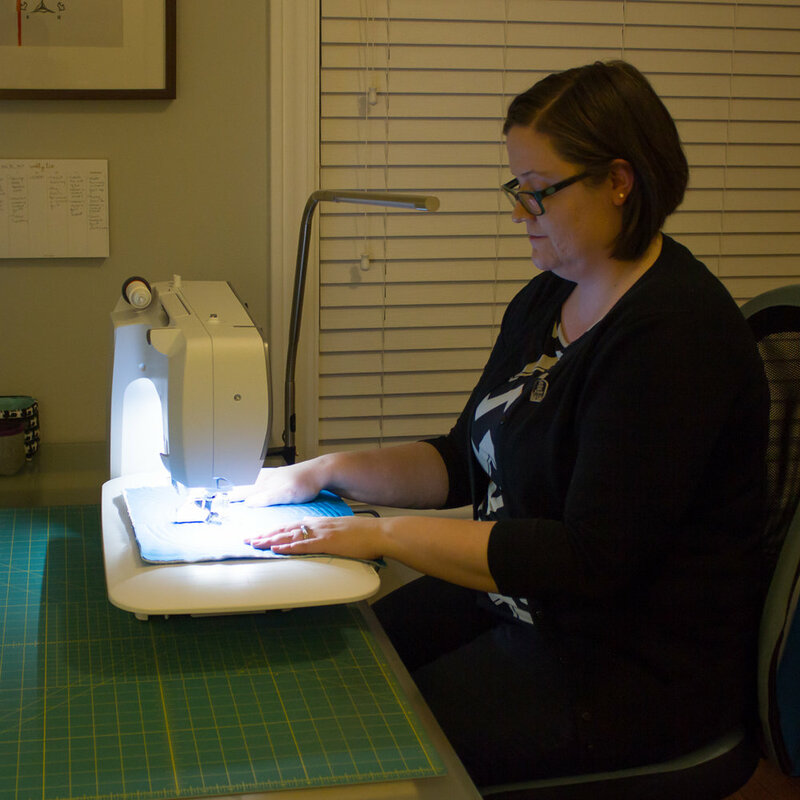 But as someone with poor vision who does most of my sewing late at night, good general lighting for my sewing studio has always been a struggle. So I was thrilled when Daylight Company sent me a beautiful Slimline LED Table Lamp to review! I first saw this lamp at QuiltCon 2017 and thought it would be an incredible addition to my sewing space. I thought this extra task lighting would help me out, but it made an even bigger difference than I expected! Take a look at some pictures of the exact same space with the lamp off (top pictures) vs. on (bottom pictures). In addition to brightening up any room, the Slimline Table Lamp is designed with quilters in mind. It has an adjustable clamp so you can move it to any sewing area, and it pulls apart in the middle and fits in a carry on suitcase. It's perfect to take to retreats or classes! I only like telling my pals about sewing products I really believe in. Trust me - I recently said no to working with a sewing industry company because I don't exclusively use their products in my sewing! When I say that I love my Slimline, you can know that I mean it. This lamp has made a huge difference in the stress on my eyes and its sleek design is a welcome addition to my sewing space. If you want to order a Slimline LED Table Lamp, click here! You can also follow @daylightcompany on Instagram for more pictures of the variety of ways you can use this lamp.